← Channel Your Inner Cookie Monster with These Great Mixes From Krusteaz and Enjoy a Back-to-School Giveaway! 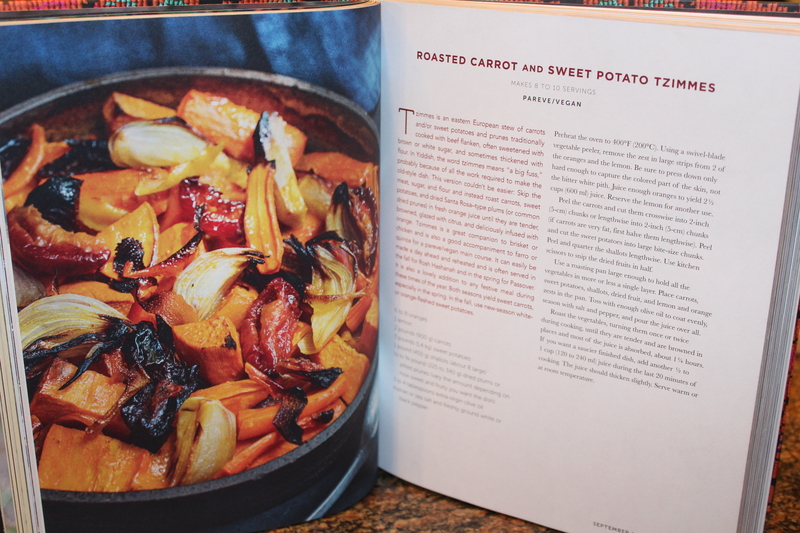 To be honest, until I received a review copy of The Seasonal Jewish Kitchen: A Fresh Take on Tradition by Amelia Saltsman, I had never heard of the Yiddish term tzimmes, which is a casserole of vegetables, fruit and occasionally meat. As I was paging through this wonderful cookbook, I decided to try this recipe as part of my upcoming review, and was so glad I did. What a wonderful and fresh combination of flavors that tastes as good as it looks. And it’s so easy to make — just peel and chop a few vegetables, juice some oranges and a lemon, place in a casserole dish, and voilà!, roasted perfection. Tzimmes is often a side dish for Rosh Hashanah and Passover, but you certainly don’t have to be Jewish to enjoy it. Serve it with any meal to make it more festive, especially in the fall with its beautiful colors! It makes a great side dish for chicken or brisket, or keep it vegan and serve it with quinoa as a main course. Preheat oven to 400 degrees F. Remove the peel of one of the oranges and the lemon in large strips, making sure not to include the bitter white pith. 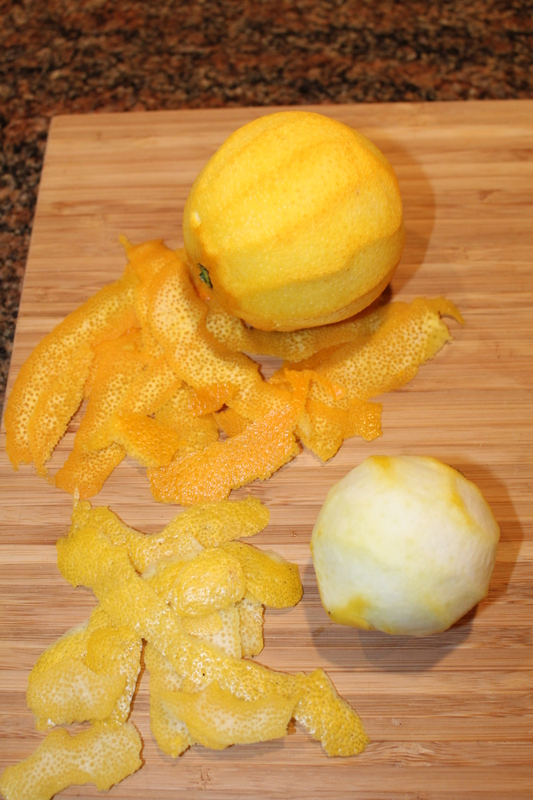 Juice the oranges and the lemon to make 1 ¼ cups of liquid. Peel the carrots and sweet potatoes and cut them into bite-sized chunks. Peel and quarter the shallots. 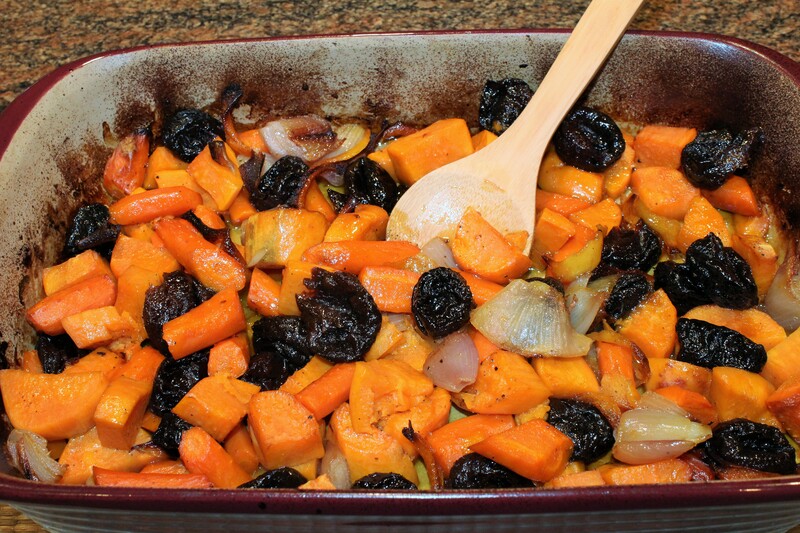 In a large roasting pan, arrange the carrots, sweet potatoes, shallots, prunes, and lemon and orange zests in a single layer. Toss with the olive oil and sprinkle with salt and pepper. Pour the citrus juice on top. 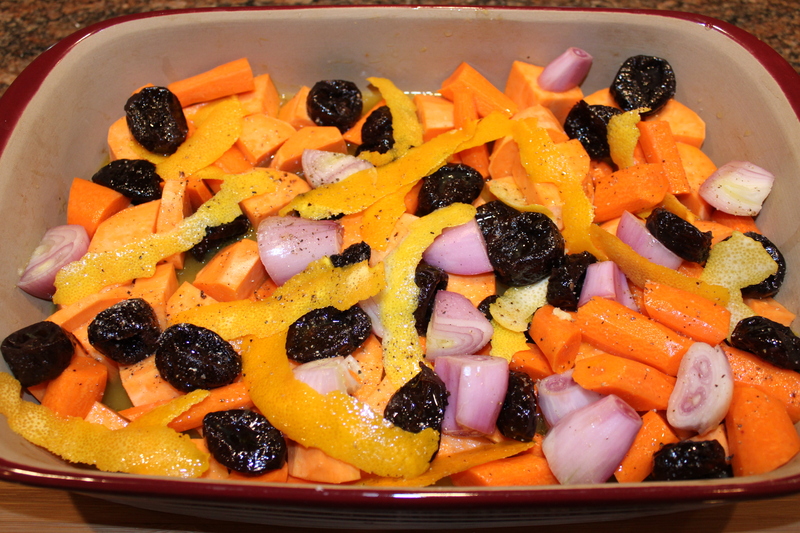 Roast the vegetables for about 1¼ hours, turning a couple of times. 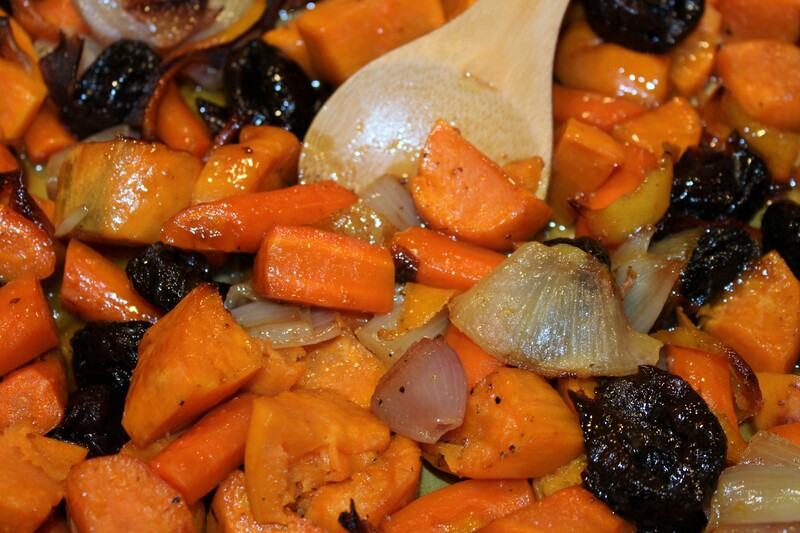 The vegetables should be tender and browned in places, and most of the juice should be absorbed. 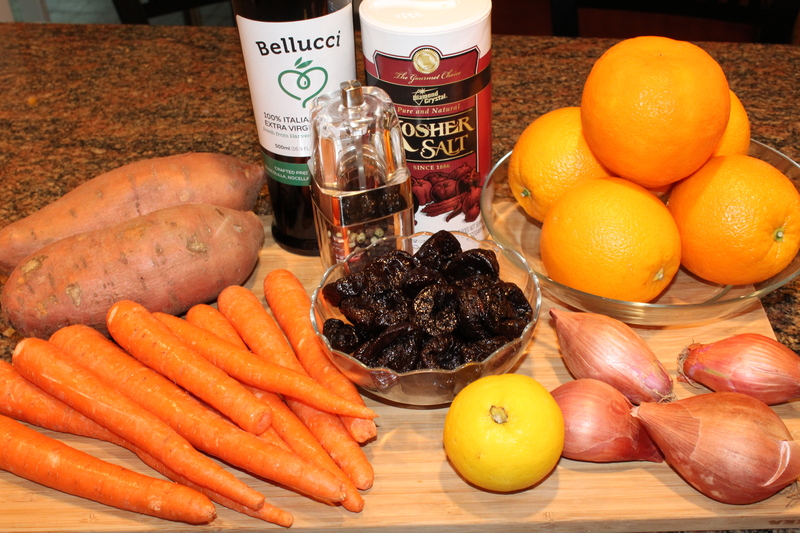 This entry was posted in Recipes, Tips, Vegetables/Vegetarian/Vegan and tagged Amelia Saltsman recipes, eat drink and be merry, Kelley Chisholm recipes, Roasted carrot and sweet potato tzimmes, Seasonal Jewish Ktichen recipes, tzimmes recipes. Bookmark the permalink.